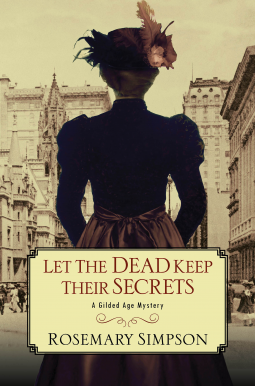 A mystery set in 1880s New York City: Let the Dead Keep Their Secrets by Rosemary Simpson – Joyce's mystery and fiction book reviews with some non-fiction too! This book had been in my TBR pile for a while; I am very glad that I recently moved it to the top of my list. This novel, the third in Rosemary Simpson’s series, is the first that I have read. I will most likely go back to read the others. Old cases are alluded to but one does not have to enjoy the books in order. In this one, the series regulars, Prudence, an heiress, and Geoffrey, a former Pinkerton agent, are solving a case in 1880s New York City. They are visited by an opera singer, a twin, whose wealthy sister died in childbirth. There are suspicious circumstances and later another post partum death. Of course a focus of the book is “who did it?” but even more, the story becomes one in which the reader waits to see if the murderer will be stopped. While I know that, in the majority of mystery novels justice is done,this was nonetheless a page turning and suspenseful read. The time period is exactingly and realistically portrayed. There are details about those who photographed the newly dead as a way to remember them. These memorial cards were regularly given to mourners. The photographer in this book is obsessed with trying to capture the moment when breath/soul leaves the body. Another photographer also makes an appearance in the book. History lovers will enjoy the appearance of Jacob Riis, the chronicler of the Lower East Side, who has a featured role. This book is recommended for those who enjoy historical mysteries. Fans of Victoria Thompson should like this author’s works. Many thanks to NetGalley and Kensington books for this e-galley in return for an hones review. I didn’t even hear about this book coming out! I loved the first book of the series, though the second book, for me, was pretty mediocre (not horrible, but not great either). But I really want to read this book! And I agree with you, it’s really similar to the Gaslight series.